If you’re new to the sushi world, shrimp tempura is a great way to dip your toe into this delicious pool! All of the ingredients are cooked and amazing! My wife and I love sushi. Unfortunately, it’s ridiculously expensive. Being that my wife and I follow a pretty strict budget, we decided to try and learn how to make our own! After a few failed attempts, we finally got it right!! 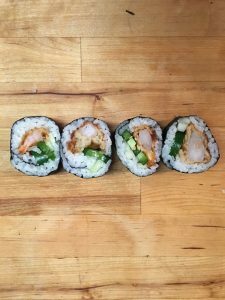 I want to save you all some time and share how we create some crazy good and crazy CHEAP sushi!! The rice can be found at any big box store and it’s important to use sushi rice. We tried to make sushi with minute rice once… Our poor thinking was fueled by hunger and desperation… It was a disaster. This is the most expensive ingredient but, you absolutely need it!! Take your time and ensure you follow the steps below! The foundation to your awesome homemade sushi is the rice. If you don't create a sticky rice, rolling will be impossible. Take it from me... trying to roll sushi with rice that isn't sticky is wildly aggravating! Thoroughly rinse the rice under running water. The water should run clear before you move on to the next step. If you don't remove the starch from the rice, it'll turn into a sloppy mess and will NOT become sticky enough to roll. RINSE IT! Place the rinsed rice and water over high heat. Bring to a boil. Combine rice vinegar, sugar and salt in a microwave safe bowl. Microwave for 30 seconds. Place the rice into the refrigerator until cool. This will allow the rice to become nice and sticky. That will make the rolling process a lot easier!! How to Make Sushi Rice The foundation to your awesome homemade sushi is the rice. If you don’t create a sticky rice, rolling will be impossible. Take it from me… trying to roll sushi with rice that isn’t sticky is wildly aggravating! Keyword: Shrimp, Sushi, Tempura Prep Time: 5m Cook Time: 25m Total Time: 30m – 2 Cups Botan Calrose Rice – 2 Cups Water – 2 T Rice Vinegar – 2 T Sugar – 1 T Salt 1) Thoroughly rinse the rice under running water. The water should run clear before you move on to the next step. If you don’t remove the starch from the rice, it’ll turn into a sloppy mess and will NOT become sticky enough to roll. RINSE IT! 2) Place the rinsed rice and water over high heat. Bring to a boil. 3) Once the water starts to boil, reduce heat to low and cook for 15 minutes 4) After the rice has finished cooking, remove from heat, leave covered and sit for 10 minutes 5) Combine rice vinegar, sugar and salt in a microwave safe bowl. Microwave for 30 seconds. 6) Once the rice has set for 10 minutes, mix with vinegar|sugar|salt 7) Place the rice into the refrigerator until cool. This will allow the rice to become nice and sticky. That will make the rolling process a lot easier!! 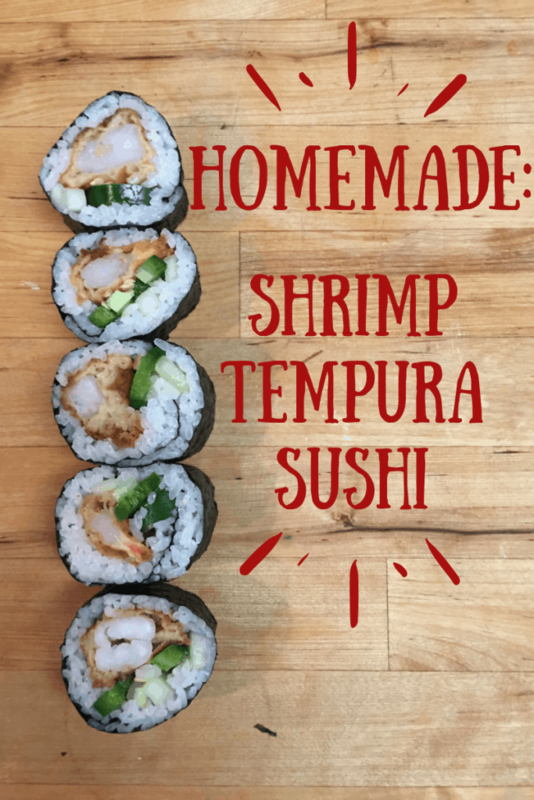 Making shrimp tempura is incredibly easy! You really only need an egg, flour and some cold water. It’s that easy! You can use canola or vegetable oil. Today, I used vegetable oil because it’s what we had on hand. I use a large, deep saute pan to fry the shrimp. Finally, get a grease/splash screen… your forearms will thank you! A light, crispy, crunchy tempura that will take your sushi to the next level! You can use cooked or uncooked shrimp. Personally, uncooked seems to turn out better but, today... we have cooked. Cut the shrimp about 1/4 of the way through to allow the shrimp to cook and not shrink. 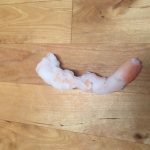 It will create a nice straight piece of fried shrimp for your rolls. Beat the egg and ICE COLD water together until the mixture is nice and fluffy. Add in the flour and mix rapidly. The mixture should appear a little thinner than you're expecting. That's OK! Add in salt, pepper to taste. I personally like to add in a lot of pepper and cayenne pepper. Not necessary but, pretty damn good! Fry the shrimp in Canola or Vegetable oil. If the shrimp is cooked, it will only need to cook for 30-60 seconds per side or until light brown. Hand rolling sushi seems difficult. It’s really not. It takes a bit of practice and some patience but, after a few tries my wife and I were able to master it quickly. One notable tip… Cover your bamboo mat with a Ziploc. This will keep things from getting messy. You can find nori on Amazon or at any big box grocery store. I typically order it on Amazon, it’s cheaper. I like to use Deluxe Nori. It’s $10.47 for 50 sheets. You can find it by clicking the link! 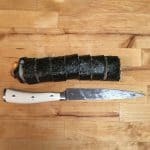 Hand rolling sushi doesn't have to be intimidating! 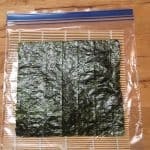 All you need is some nori sheets, warm water and patience! 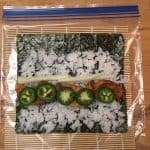 Place nori on top of your covered bamboo rolling mat. Be sure to place the nori shiny side up. Spread your sticky rice out over the nori. Leave about an inch of the nori uncovered. This will help your roll seal up when rolling. Roll baby, roll! Check this video out for some rolling tips! Sushi cutting tips: Wet your knife with warm water before each cut. Cut the roll in half, then cut each half in half, and finally cut each section in half again. This will give you nice even sections! Lets Roll This Sushi!! 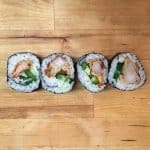 Hand rolling sushi doesn’t have to be intimidating! 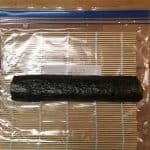 All you need is some nori sheets, warm water and patience! 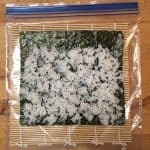 Keyword: Shrimp, Sushi, Tempura Prep Time: 15m Total Time: 15m – 1 Bamboo Rolling Mat – 1 Sheet Nori | Seaweed Sheet – 3/4 C Cooked Sticky Rice The amount will vary as you learn to roll – 3 Pieces Shrimp Tempura – 4-6 Slices Cut Jalapeno – 4 Slices Cut Cucumber 1) Place nori on top of your covered bamboo rolling mat. Be sure to place the nori shiny side up. 2) Spread your sticky rice out over the nori. Leave about an inch of the nori uncovered. This will help your roll seal up when rolling. 3) Place your shrimp, cucumber, and jalapeno on top of the rice 4) Roll baby, roll! Check this video out for some rolling tips! 5) Sushi cutting tips: Wet your knife with warm water before each cut. Cut the roll in half, then cut each half in half, and finally cut each section in half again. This will give you nice even sections! 6) ENJOY! This is my favorite part… eating! 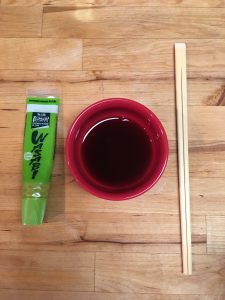 Personally, I like mixing a lot of wasabi with soy sauce. If my nose isn’t burning, I’m not using enough wasabi!! Leave a comment and let me know how it turned out!! ⟵Is Becoming Debt Free Worth Giving Up Your Happiness?